In nature, pigs are active creatures. They require regular exercise, both physically and mentally. Physical exercise helps prevent obesity, always a risk factor in pet pigs, while mental exercise prevents boredom and possible destructive behavior. Your pig enjoys taking walks with you as much as any dog. Use a harness rather than a collar when going out for a stroll with your pig. They're easily leash trained as long as you start slowly and don't hurry them along. Pigs like a schedule, so try to take your pet on a walk at the same time each day. Regular walks also provide a way for your pig's hooves to wear down naturally. On hot days, pigs need a place to cool off. Once the temperature gets above 75 degrees, it becomes difficult for the pig to cool himself. A children's plastic wading pool with several inches of water in it provides a place for your pig to relax and beat the heat. Pigs love to explore. If your pig hoovers around your house, he's not necessarily looking for food but checking out his environment. This behavior can turn destructive if your pig isn't provided with appropriate distractions. Give him items that he can tear up, such as cardboard boxes or newspapers, or indestructible kids' toys to play with. Since they're so smart, pigs can learn basic commands fairly easily. You can also teach him tricks, such as "roll over." Reward your pet with low-calorie treats when he responds appropriately. Pigs root. It's part of their nature, a favorite activity and not a habit you can break them from doing. Provide your pig with a place outside to root, or put together a special dirt-filled box for him to root in. Because he'll make a mess, change the dirt regularly. You can also place large, smooth rocks in a box and scatter his pelleted food inside it. This means that eating his meal takes time and effort, rather than just gulping it down from a bowl. Indoors, give him an old towel or blanket for rooting purposes. The Merck Manual for Pet Health recommends hiding favorite toys in the towels or blankets, creating a rooting game. Therapy animals aren't just limited to canines. 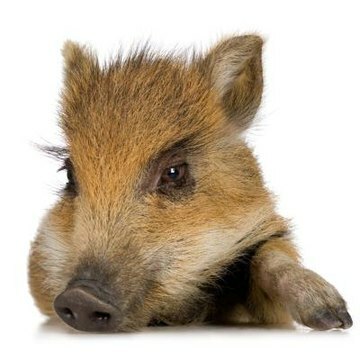 Porcines can also bring happiness -- and novelty -- to patients in nursing homes, group homes and similar facilities. You'll need to have you and your pig certified as a therapy animal team by a licensed evaluator. Since many pigs don't like dogs and can become aggressive toward them, make sure your pig is comfortable around canines, as they may cross paths in therapeutic settings. In addition to basic training tests, your pig will be tested to find out whether she can be safely hand-fed, as well as whether she will allow the evaluator to touch it all over.